Point Shot: Wayne Simmonds a fit as a Bruin? - The Point Data-driven hockey storytelling that gets right to the point. Point Shot: Wayne Simmonds a fit as a Bruin? With the Toronto Maple Leafs making a big splash this week, acquiring Jake Muzzin from the Los Angeles Kings, the Boston Bruins have to be feeling the pressure to upgrade their team ahead of their potential first-round matchup with the Leafs. Don Sweeney, the Bruins GM, has to be looking around the league for a way to bolster his top-six. David Pastrnak, Patrice Bergeron, and Brad Marchand make up one of the deadliest top lines in the league but they need to add depth to their forward units if they want to make a deep run. 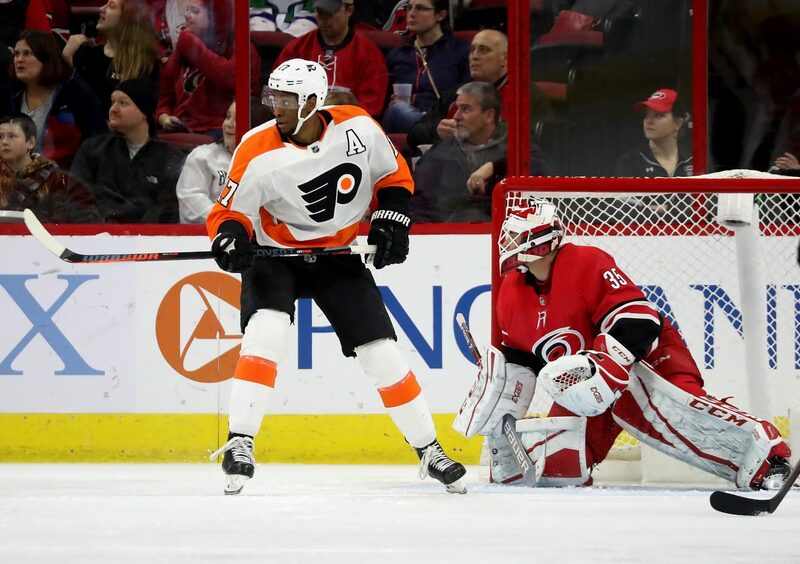 One of the most rumored trade bait pieces ahead of this year’s trade deadline is Wayne Simmonds and with the Flyers and Bruins playing each other tonight, it got us thinking – would Simmonds in a Bruins uniform for the post-season make sense? Simmonds brings a hard-nosed game that fits perfectly into playoff hockey and would immediately endear him to the Bruins faithful. He’s known league-wide as a player who loves to get to the front of the net and create havoc. Out of his 15 goals this year only two of them have come from outside the inner slot. Simmonds has 15 goals on a down year this year and he would still have the most goals on the Bruins outside of their top three of Pastrnak, Bergeron, and Marchand. He would give their second-line an immediate boost most likely playing alongside Jake DeBrusk and David Krejci. An area the Bruins haven’t seemingly struggled with this year has been their power play. Ranked second in the league behind the Lightning in power play percentage, the Bruins have been dynamic on the man advantage but they do have one flaw there, their net-front presence. The Bruins most common top unit has been a combination of Pastrnak, Bergeron, Marchand, Krug, and someone in front of the net. They’ve tried five different guys on that unit, in some part due to injury, but mostly due to a lack of a big-bodied net-front guy. Simmonds would slot into that position seamlessly and give them a deadly top unit. Coincidentally, the Bruins take on Simmonds and his Flyers tonight in what could be a showcase game for the Bruins fans to get excited about a future fan-favorite in Boston.